What stops you? When are you in the middle of a journey and a bit red stop sign seems to appear out of nowhere, nearly hitting you in the head and screaming, “STOP!”? Think about when you’re working out. What’s your limit? What screams out to you, demanding you stop? If you don’t work out, perhaps you should consider what screams “stop” at you when you momentarily consider getting off the couch or outside your busy routine? I was at the post office on a particularly cold winter day. I had decided not to walk outside. I didn’t want to bundle up as tightly as an Eskimo so I either couldn’t move or I’d start to sweat under my many layers. I’d get on the elliptical later in the day. I walk regularly, so many people know me, if not by name, by my routine of walking. I admitted I had decided it was too cold. Yes, he was right. Of course, he had walked. He wasn’t bragging. He was encouraging, letting me know I could persevere. The cold didn’t have to stop me. He was right. This is the man who walks by my house every morning. He only misses a few days a year. He’s quite a bit older than me, and he has significant physical challenges. He often walks with a tall walking stick. His walking gait doesn’t seem comfortable to me, but he’s moving – quite quickly, I might add. He enjoys walking, because he can walk. He knows if he stops, he’s going to lose the already limited range of his ability to walk. He appreciates what he can do, so he doesn’t let what he thinks he can’t do limit him. I’m motivated – and convicted – every time I see him walking. If he can get outside on a regular basis and push though discomfort, weather and schedule conflicts, I certainly can. He walks because he can. His limits are beyond mine even though I can physically do things he can’t. I think. What’s your spiritual limit? How are you limited your faith? When does discomfort make you pause or stop? When do you press your hands tightly over your ears to block out the conviction to move, change and grow? God provides limits for you. He has boundaries for you, because he loves you. He knows you need limits for focus and security. We don’t have to limit ourselves. We only have to listen to God’s limits and live by them. It’s not as easy as it seems. We can refuse to listen. We can think we heard one thing when God is actually saying something else. We can rationalize what we think God is saying to justify what we want. God is unlimited. We cannot limit him even if we try. You don’t need to compare yourself to others. Comparisons cause you to either feel inferior because of what others are doing or feel superior because of what others aren’t doing. God doesn’t define you based on who others are. He defines you on who he created you to be. I was in Israel for two weeks, staying in three different hotels. I knew my days would be long, filled with unforeseeable wonders. I was leading a women’s group, so I wanted to be prepared for each day full of questions, needs, and personality differences. That meant spending some time allowing God to ground me, so each morning I got up earlier than most others and went for a walk. I was in the third hotel the longest, nearly a week, so it’s where I got into the most consistent routine. Every day, I’d walk from our kibbutz to the Old City. There was part of me that still felt like a foreigner. I was definitely an observer. I loved watching people going about their daily lives, opening their shops and carrying fresh breads and fruit to set up for the day. People walked their dogs, cars lined the roads carrying people to work, and children walked to their schools. People greeted me on the street, usually in Hebrew. I had learned enough to be able to respond, but I was fairly certain they knew I was a foreigner just the same. There was also a part of me that felt I belonged there. Some of it was because I simply felt “at home” in Israel, as if a homing device had at some point been planted inside of me, and while I had been unaware of it all my life, it clicked into place once my feet hit Israeli soil. Part of my belonging was because I had found my way around the area of Jerusalem in which I was staying. It didn’t take me long to find a regular, safe route to walk every day. As I repeated the path, I saw similar faces and places. I felt I was a part of the morning routine and traffic. I slid into the flow of life on the streets of Jerusalem. While I likely stood out to some, I didn’t see any indication that people looked at me any differently than anyone else out and about in the mornings. Perhaps it’s because people in Israel are so diverse. I could set aside the fact I was walking on holy ground and appreciate that I was walking among diverse people: people who were struggling with finances, relationships, jobs, conflicts, and faith. Just like me or anyone else. We can look around and appreciate diversity while acknowledging similarities. No one person is exactly like another, but we can certainly find commonalities. As I walked alongside and crossed paths with others, my heart seemed to beat a familiar heartbeat with those around me. I felt connected. I was doing life among familiar strangers. There was a connection despite my foreign citizenship. Be attentive today. Notice those you see as different from you. Do you draw a firm line in the sand to separate yourself – or the other person? Erase the line and look for similarities. Even when you don’t have a long-term relationship with someone, every interaction you have can be significant. God intends for you to be intentional about life. Live it alongside him. Live it alongside the people he brings into your life. Whether you’re walking side by side or simply cross paths with someone else, you each have purpose in God. He’s passionately pursuing you…and those who are doing life around you. I have a favorite trail. I don’t get to walk it very often, because it’s almost an hour from home. It was built on an old railroad route. It’s straight and flat, which might not seem appealing to many, but the foliage is beautiful. Trees gently bend over the trail to make a canopy in many places. People who maintain the trail do an exceptional job of keeping the side foliage trimmed, so it’s not obstructive, which also clears the way to notice birds, squirrels and chipmunks beside and skittering across the trail. One of the reasons I enjoy the trail so much is the memories I associate with it. My oldest daughter and I have walked it many times together. Even now that she doesn’t live at home, we try to find time to revisit it every now and then. We enjoy the length of the walk, talking along the way, and taking a short detour to our favorite restaurant for a break. Another reason I enjoy it is that it’s not my usual routine. If I walked it every day, I don’t think I’d notice as many details. I don’t think I’d appreciate the sunlight filtering through the tree tops or the variegated colored-leaves fluttering in the breeze. I might not notice the pattern of wood on the floor of the bridge or the small pools of water in the tunnel. I might not find as much thrill in the small chipmunks, which I don’t usually see on my regular walking route. And even when I walk the same distance, I don’t feel the same sense of accomplishment when I finish one of my regular routes. Interval training usually has to do with short bursts of activity alternated with longer, more enduring work. For me, I consider my Lost Bridge Trail walks as interval training in a bigger picture sort of way. My regular walks are the longer, more enduring workouts. My Lost Bridge Trail walks include a different focus. I push myself in a different way along that long stretch of flat path. As much as I push myself, I intentionally look around and enjoy the sights and sounds. It gives me refreshment in my overall fitness. My body might be tired when I’m done, but I am rejuvenated. We must seek refreshment, not just physical but spiritual. In order to gain refreshment, we often feel exhausted through the process, but it’s an exhaustion due to pursuit and effort. 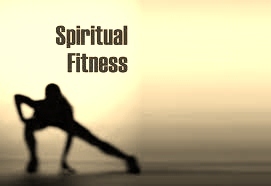 It’s satisfying even with the sore and tired muscles, physical and spiritual. What can you do today to differ your routine and invite refreshment? Let’s not define refreshment selfishly. We don’t seek refreshment because we need things to go our way. We get tired of routine, and we think there should always be adventure and newness for us. That’s not the case. Commitment is important in our relationship with God. However, we can have variety within our commitment. You don’t read just one Scripture over and over day after day. You don’t say the exact same thing every time you pray. Every sermon you hear is not the same. Appreciate the routine by putting a twist on your routine. If you have a committed place for your morning prayers or Bible study, take a break and go to a park or coffee shop. Visit another church to hear a different speaker and experience different music. You don’t have to like every new thing you try. You also don’t have to compare it to what you’re used to. You can appreciate it for what it is. You can consider it in the larger picture of your spiritual growth and appreciate how God uses a variety to challenge and nourish you. Open your eyes, ears and heart and be attentive to what he wants to give you through varied experiences. He will always be present and never be silent. In the process, you might find that special place, where you can visit occasionally and get rejuvenated, even if it takes effort to reach and complete. Several years ago, my husband and I started walking together. We had tried many times before that, but I wasn’t a very good walking partner. I liked to power walk, and I didn’t have much patience for anyone who wanted to stroll. I was on a mission, and my focus was on a good workout, which I defined as pushing myself physically. Walking didn’t have anything to do with anyone else but myself. Then I made a concession. I would go for my walk and push my limits. When I was done, I’d go for another, shorter walk with Tim. It was a compromise we could both live with. The focus began to shift from the walk to the time we got to spend together. We talked about our days. We talked about our daughters. We talked about anything that was on our minds. As we grew accustomed to walking together, we adjusted again. Instead of waiting until I got home from a walk, Tim would text me when I’d been gone for a while to find out if I was ready for a walking buddy. I rarely said no, even if I hadn’t been walking long, because I looked forward to walking with him. It wasn’t so much about me as it was about the time I got to spend with my husband. Being able to walk and talk occasionally invited topics that spurred disagreements. That’s going to happen between two married people! Disagreements when walking, however, had a different tone. We were walking side-by-side, and as we’d work through the conflict toward a resolution, we avoided much antagonism, because we were headed in the same direction. We walked and talked it out. The occasional disagreement and more frequent sharing took on a therapeutic effect. We were spending time together. It didn’t matter if we were talking about our relationship or things that impacted each of us as individuals, we were growing together. We still are. We’re not in a regular routine of walking together, but we miss it when we go very long without it. We know we can spend time together in many other ways, but there’s something special about our walks – so much so that many times I don’t insist on a walk before our walk. He walks a bit faster, I walk a bit slower, and that’s okay with me. I’m just glad to be by his side, listening to his heart. Health isn’t just about the physical. That’s often the focus, and it was certainly my main focus when determined to walk fast and far. However, there’s an emotional and relational health benefit I was missing and have been able to infuse into my walks as Tim has joined me. The physical benefits become secondary. How do you compartmentalize your health? How and when do you sacrifice one aspect of your health for another? Surround yourself with healthy relationships. Let them infuse health into many other areas of your life. Let God’s perspective invade your perspective. Let his words nourish you so that you know where he wants you to be when and with whom. He will help correct your focus if it’s misguided, and he’ll impact everything in your life when you develop a healthy relationship with him. My husband and I were on our first walk together in the Rocky Mountains. A gentle snow began to fall. We were in a canyon, and silence surrounded us. Everything was lightly dusted with snow. We could see the steps we had made. Other than that, the world looked untouched. We said very little to each other. It was too peaceful to disturb with chatter. I had been in the same area several years before, so I didn’t worry about not seeing a defined path. I walked a couple steps ahead of Tim. After walking a short distance, I suddenly stopped. Tim ran into me and started to say something as I put my hands slightly out to the side to try to communicate I had stopped for a purpose. Without glancing back to make eye contact, I quietly said, “Slowly back up.” I pointed to what looked almost like a furry white blanket meandering across our path less than 20 feet ahead. It was a wolf. I had no interest in becoming a party of three. As we backed up, we realized he wasn’t interested in us. He seemed to have been as caught off guard by the snow as we were. His coat was nearly completely showered with snow. He blended in well as he silently moved across the snow. He seemed to be looking for a place to bed down to continue an interrupted nap. He had no interest in us. Tim and I stood still for several minutes after he was out of sight, awed by what we had just seen. Our silence was broken when Tim said, “Grab the camera out of the backpack.” I knew where his line of thinking was going, and there was no way I was going to pursue a wolf who was trying to escape the falling snow. He could nap in peace. The potential adventure was nearly too much for Tim to bear, but he agreed we had seen enough. We walked just far enough ahead to look at the wolf’s trail, but the snow was now falling fast enough to have covered everything but a slight dip in the snow. We turned toward another trail and rerouted our hike. Sometimes we need to persevere despite obstacles, but sometimes it’s wiser to adjust our goals. Seeking God’s purpose for our lives and letting him reveal his vision to us is important. However, we won’t get it perfectly the first time. We’ll need to make adjustments along the way. We can have our life plan plotted on a timeline and intend to check off each accomplishment, decision and relationship along the way. It won’t be long before something crosses our paths that doesn’t just distract us but reroutes us. We can be just as intentional in our shifted goals as we were with our original goals. Goals are goals. Think about when you were young. What did you want to be when you grew up? Did your dreams change? Did your interests change? How did your experiences impact your priorities? Who helped you clarify and focus on your goals? Who had little regard for and distracted you from your goals? God intends to keep you focused on the goal of your life. It won’t usually perfectly align with his goal for your life. You’ll have to constantly tweak your goals to match God’s along the way. It’s okay. He’ll help you. Sometimes he’ll place obstacles in your way, and you’ll need to rely on him to guide you to determine whether it’s an obstacle you need to persevere through or accept rerouting. You’ll get distracted, and you’ll need to rely on God to guide you to determine if the distraction is to call your attention to something God wants you to see or to help hone your focusing skills. Even in the peaceful times, he might invite a beautiful sight to alter your path. Savor the moment. You’ll likely never duplicate it. Yet the timing and appreciation will affect your next steps and experiences. Consistency is important, but sometimes it’s the special once-in-a-lifetime experiences that stand out. The very infrequency of something strikes it with a bright highlighter, illuminating it for later attention and recollection. I rarely asked for anything special on Mother’s Day. I felt as if every day of the year was Mother’s Day, because I got to bask in the joys of being a mother. Yes, there were challenges every day, but in the context of the blessings, I could accept them and appreciate the opportunities I had. One Mother’s Day, I surprised everyone by announcing there was just one thing I wanted: to load up everyone’s bikes and go for a ride on my favorite hiking path after church. No one was as excited about it as I was, but they entertained me. The girls weren’t very old, and they knew the bike ride would be long and challenging. Tim knew he wouldn’t be able to ride his bike at full speed with the rest of us along. But we packed a lunch and headed to the trail after church. It was a glorious day for me, and no one else seemed to mind it much at all either. We rode five miles, stopped for a lunch break beside a small lake, and made the return trip. It was a gorgeous day. Had I experienced bike rides with my family every weekend, I probably would have enjoyed some of the experiences and endured others – when someone would be grumpy or get hurt or the weather wasn’t ideal. As it was, I had one glorious day of memories with my family on our bikes on that path. Something similar happens when we go on a retreat or attend a conference. We walk away rejuvenated and ready to tackle our lives with renewed energy and purpose. The infrequency makes these experiences impactful. We build time with God into our daily lives: devotions, prayer, accountability. While we benefit greatly from the consistenty, daily also means routine. When we’re at conferences and retreats, we step away from routine. While routine is excellent for discipline, occasional escapes encourage us to listen in fresh ways. How can you capture renewed energy and purpose on limited time, money, and flexibility? Use your senses. Quietly reading your Bible is wonderful. Experiencing God’s Word through multiple senses helps us put an exclamation point on a verse. Consider how you can see, hear, and touch Scripture. Use repetition. Carry your quiet time throughout the day with you. We too easy compartmentalize our time with God. Choose one key verse of the day and post sticky notes in places you’ll find them throughout your day. Set your cell phone alarm to vibrate hourly as a reminder to reflect and act on the verse. Use social networking. De-compartmentalized your faith while engaging others. Tweet a verse each day on Twitter. Post a reflective question or action challenge on Facebook. Whatever your approach, seek renewed energy and purpose with occasional escapes from routine. Listen to God in fresh ways. Open your ears to hear from God.